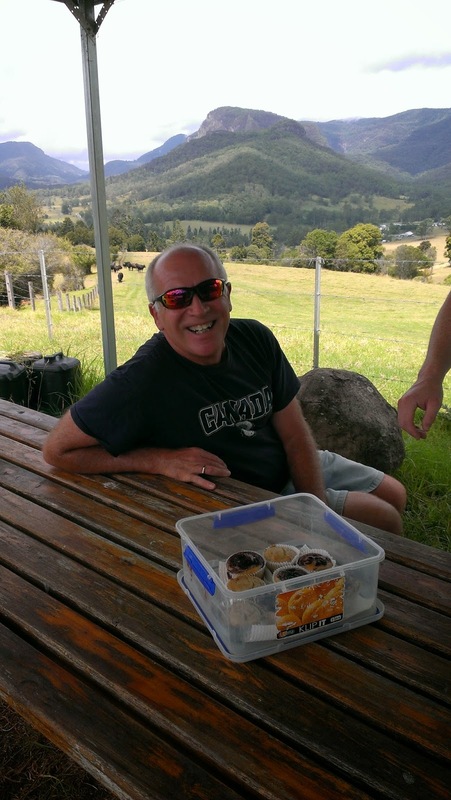 We were off again today on one of our Gold Coast Tourist jaunts. 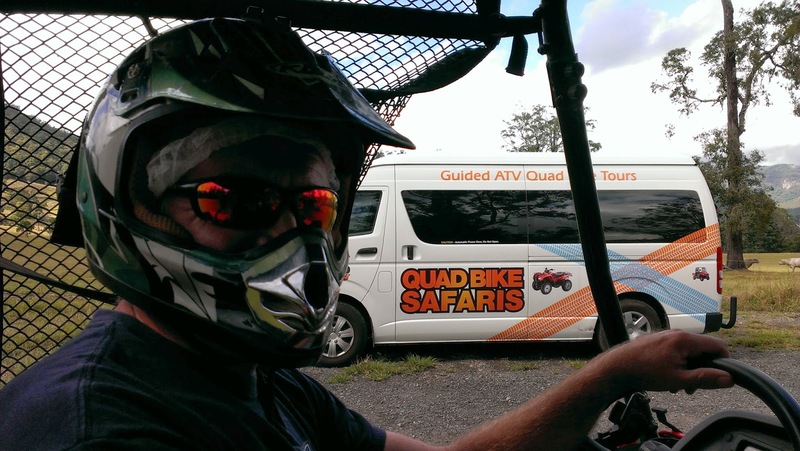 This week we choose to do the Quad Bike Safari at Numinbah Valley www.atvadventures.com.au and what an awesome time we had. 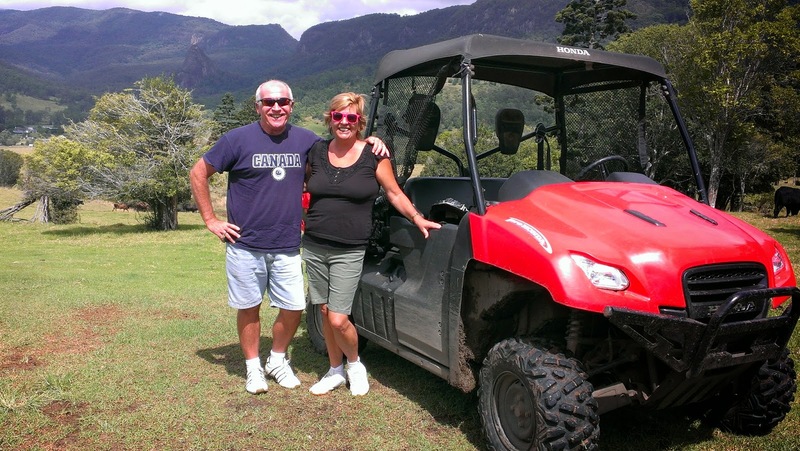 What a fantastic way to spend the morning out on these terrific ATV (All Terrain Vehicles) in some of the most spectacular surroundings you will find anywhere in the world with the mountains, bush and wildlife. 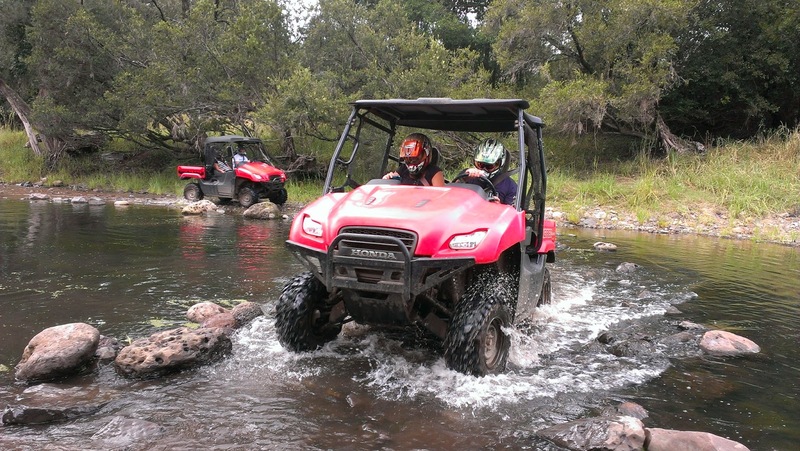 We choose the 2 seater, because to be honest I have tried to ride these things in the past and wasn't too successful so it was great they have the options for either a 1 person or 2 person vehicle. We started our day with our short 30 minute drive to Numinbah Valley which is so lovely in itself - and our meeting point was at the NV (Numbinbah Valley) Cafe - with a good 30 minutes up our sleeves we decided to fill our tummies with a bit of yummy breakfast in this quaint little cafe across from a paddock of cows meandering around while we waited to be picked up. Between the drive and the breakfast we had already had a brilliant start to the day. Soon Tod and the bus was there to pick us up to take us to the short drive to the farm where we were to be spending the rest of the morning with our new friends Grant and Mel from Melbourne a lovely young couple here on holidays and looking for adventures other than beach and theme parks. 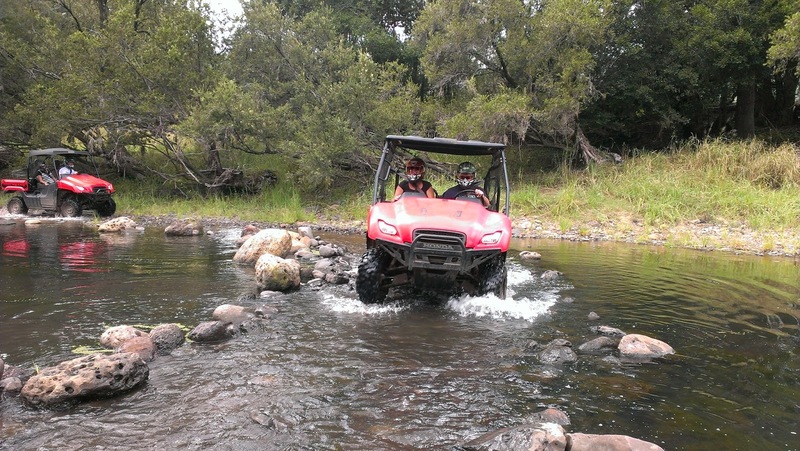 Having had a good induction we donned our helmets and took off around the property, starting on small circuits first to get the hang of driving and then on to some more challenging sections including some quite steep little hills, creeks and around the dam walls. 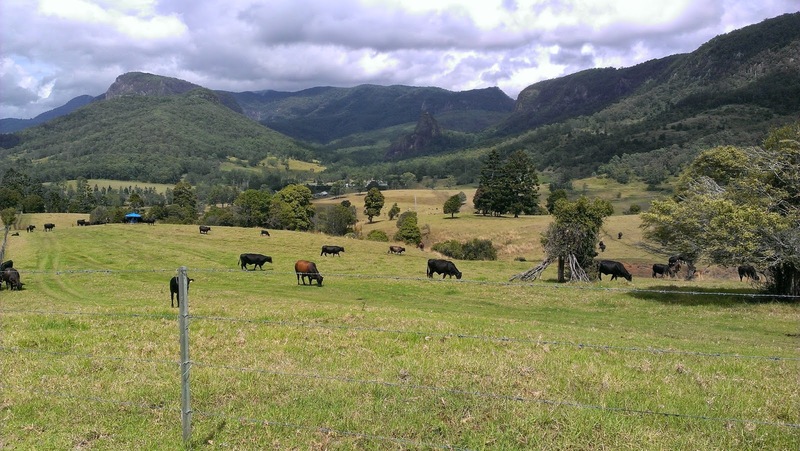 Being in the hinterland there was no lack of views where ever we went and this made the trip even more enjoyable with the stunning views and the farm animals to negotiate around. 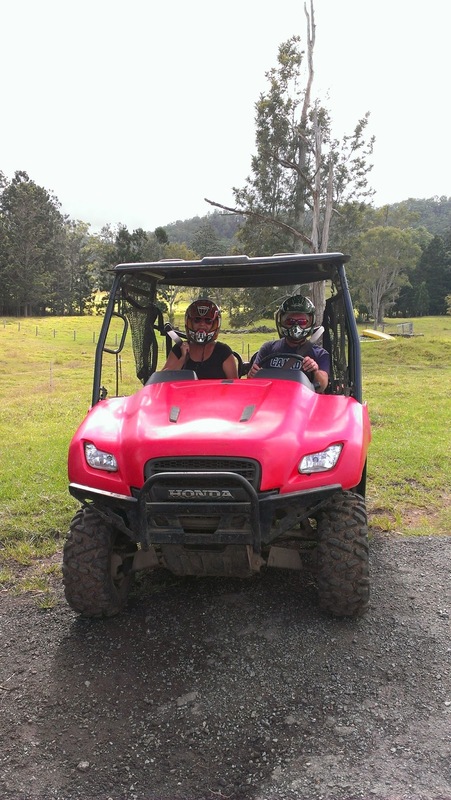 This isn't about speed, it isn't about being stupid its about enjoying our Gold Coast hinterland in a unique fashion and while the vehicle do not go fast there are definitely times when the tracks are only just wide enough for the ATV to get through so its not a boring trip for those looking for some hot rod adventure but it isn't about being speed demons or hillbilly warriors. Wendy and Tod our hosts where definitely passionate about their town and its surrounds and had lots of great stories to tell about the area which makes the day even more personal and enjoyable, we had a lovely morning tea of muffins (I had the banana one and it was delish) and drinks before heading off for a few more challenging areas around the property. Thanks guys you do a great job! 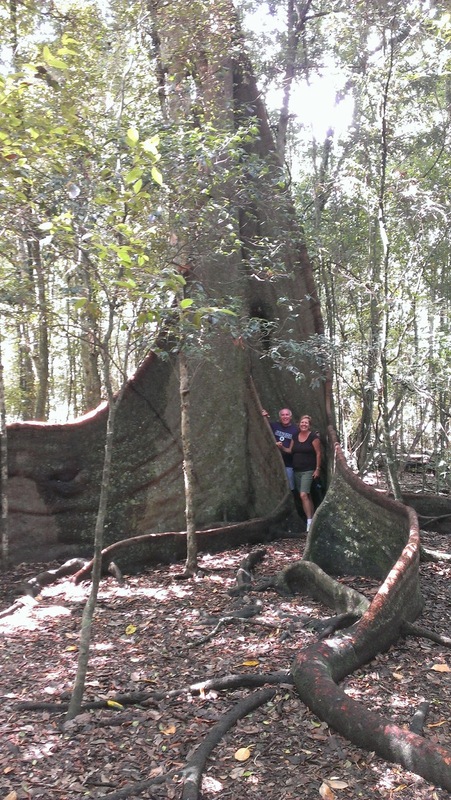 Before heading back we stopped into the rain forest section to see a huge Fig tree that has been on the property for 105 years since the current owners family came there so it is thought to be at least 300 years old, this was a nice interlude and provided that touch of difference to this trip. 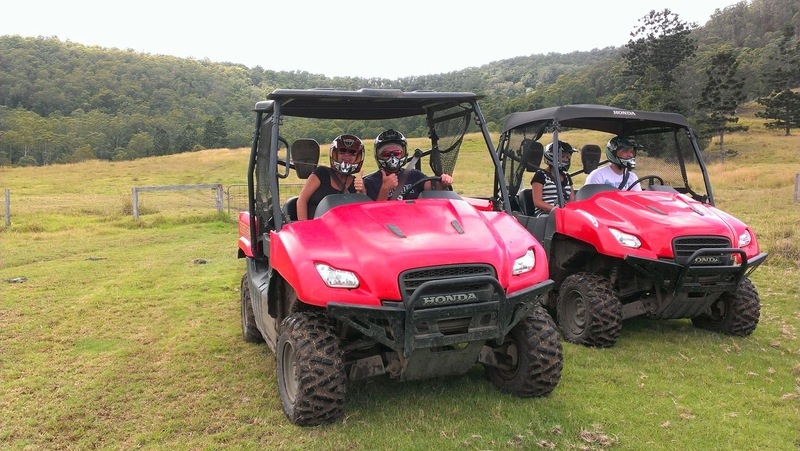 We would highly recommend this for a great day out for anyone looking for something a little different and a new and exciting way to see our Gold Coast Hinterland and its beautiful surroundings including volcanoes and Mount Warning while having a great time (even if it is a bit bumpy along the way). I think we all really enjoyed ourselves and the time seemed to go at a good pace, with stops along the way, good photo opportunities, perfect environment and good company, you can't go past that. 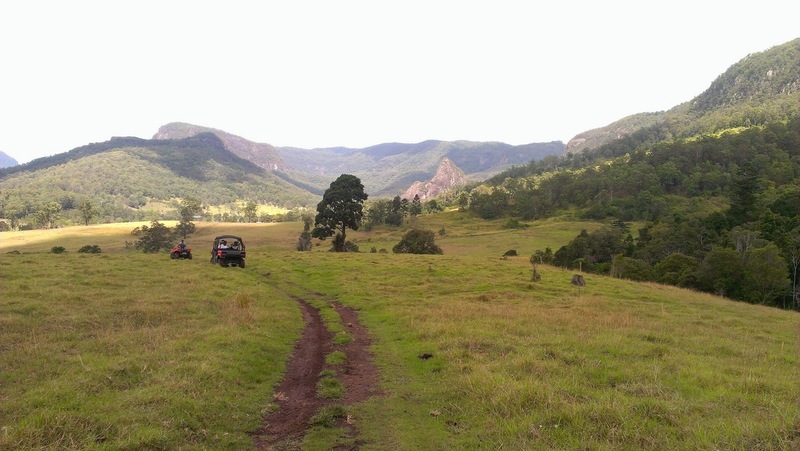 This area has some other fantastic scenery including National Arch, Springbook etc so you could spend the morning doing the ATV tour an unconventional way of seeing the area, stop at NV Cafe for lunch and then go off and do the more traditional site seeing of the area (there are probably other cafes in the area as well). It is sometimes hard to believe all of this is just 30 minutes from home and we really felt we were a million miles away and as usual left with big smiles on our face!